Can I set a delay on startup sounds? Is there a way to have the start up sound wait like I did in conky like this? 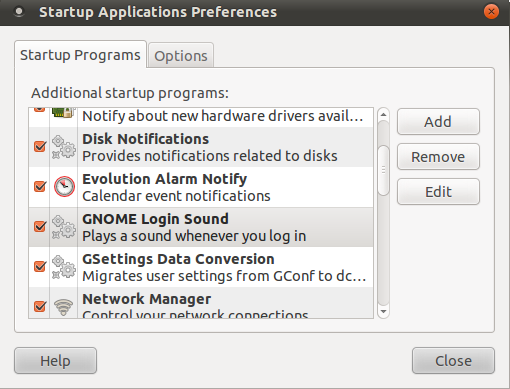 Shutdown sounds were removed from Gnome, unfortunately. As for startup sounds, they should play fine (you shouldn't need to delay them; they'll continue to play after your desktop is available). Then you'll be able to select your theme in the drop-down of System / Preferences / Sound / Sound Effects / Sound theme. Not the answer you're looking for? Browse other questions tagged startup shutdown or ask your own question. How can I play different sounds each time I startup?